Debuting April 28 on VOD and coming to theaters on May 13, "High-Rise" opens on imagery of a scruffy Tom Hiddleston in disheveled business attire. He is meandering through bloodied, squalid conditions of looted destruction where we find him rotisserie cooking an unusual dinner on a retrofitted spit. His third-person voiceover, backed by a classical record playing in the background, speaks of eerie satisfaction and renewed confidence amid the obviously dire conditions. A jack-hammered transition card hits declaring "three months earlier." That setup begs our minds to question what has transpired to create this reality. Consider that a perfect tease and taste of what is to come in Ben Wheatley's adaptation of J.G. Ballard's dystopian 1975 novel. In the words of Bachman-Turner Overdrive, "you ain't seen nothing yet." At this new starting point, set in the late 1970's, the Tom Hiddleston we meet is greatly different. He is Dr. Robert Liang and he has just moved into an angular and tiered cement residence building as part of a newly-constructed complex of high-rises in a nondescript suburb of London. Liang is a chilly forensic doctor and an eager social climber seeking new anonymity, a clean slate, and an investment into something unique for a living space. He resides on the 25th floor, which counts as upper middle class within of the 40-story building. The high-rise was designed to be self-sustaining and self-sufficient with all of the necessary amenities, from groceries to recreational facilities and security, available on the premises for its discerning homeowners. The orchestrator of this well-to-do lifestyle is Anthony Royal, dubbed "The Architect" by the social circles beneath him. Played by Oscar winner Jeremy Irons, he leads this designed and desired utopia from the top in his terraced top-floor penthouse with his trophy wife (Keeley Hawes). Lavish parties are the seen-and-be-seen events within this closed circuit of a community. Robert attempts to mingle with the myriad of white privilege residents of the building. He catches the romantic eye of Royal’s personal aide, Charlotte Melville (Sienna Miller), a woman with a curious son (Louis Suc) lives in the next floor above him. Quickly, Robert experiences the trappings of the building's readily apparent, yet unwritten, hierarchy and befriends people of different classes. Second floor tennant Richard Wilder (Luke Evans), a TV documentarian, and his depressed pregnant wife Helen (Elisabeth Moss) reek of discontent and embody the brewing struggle of the poorer residents from the lower floors. Little inconveniences like power outages turn into arguments and tiffs. Envy overcomes decadence. Hosts become bullies and people reveal their classist flaws. Pettiness boils over to rage. Neighborly relationships devolve into isolation. Uncivilized competition decays community harmony. Schemes turn into wars were resources like food, electricity, perks like swimming pools, and the freedom of elevators become contested to the death. Primal violence takes over on every imaginable level. By the time Portishead’s haunting cover of ABBA’s “S.O.S.” shows up, you realize how much everything has changed. Tom Hiddleston is an ideal lead for Liang. He has the charismatic range to swing from a man built for the finer things to a sullen survivor of cold calculation and resolve. His wicked smirk and smooth line delivery cloak his character’s emotions and intentions brilliantly. Hiddleston is simply intoxicating, as he so often is in both his smaller films like “Only Loves Left Alive” and Marvel blockbusters. Luke Evans provides the strongest voice and performance outside of Hiddleston as the man targeting Royal and system and asking the loud questions no one wants to answer. Director Ben Wheatley ("Kill List," "Sightseers") has crafted a sharp film of unraveling thrill and suspense that drips with endless style. 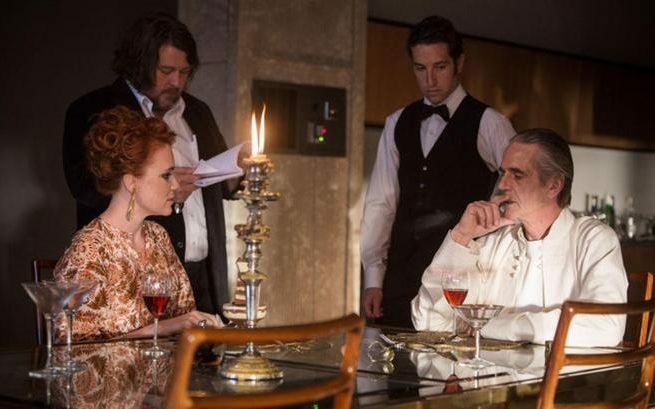 The director made a wise choice to keep Ballard’s 1970’s setting and time period, giving “High-Rise” a throwback feel and lively tone on multiple levels. Composer Clint Mansell and cinematographer Laurie Rose tinge this film with an auditory and visual palette with period-appropriate filters of soundtrack and light. If you did not know these modern actors, you could have sworn this film was made 40 years ago. The cool exterior of swinging ambiance acts as sheep’s clothing for a savage wolf underneath. This film’s time capsule surface dissolves to keenly project its stout cautionary tale towards parallels to the modern day. "High-Rise" is a strongly constructed blend of experimental science fiction with colossal political and social commentary. The layers of symbolism, analogy, and allegory are as tall as the building itself. There is a richly disturbing and dark fascination in observing how all of this frivolity comes crashing down in unpredictable and unlimited disaster. In this writer's opinion, inspired by a more pertinent and interesting source, this is the stylish and topical film the overrated "Snowpiercer" could only hope to become with its similarly isolated microcosm of class warfare.